The Alexandria Daily Gazette, Commercial and Political (Alexandria, VA) lists Edwin Gray as a "Randolphite" and Richard Byrd as a "Fed." "The first [Richard Byrd] is a Federal Republican - the second [Edwin Gray] a Randolphite - and the third [William Massenburg] a Jeffersonian Democrat." Poulson's American Daily Advertiser (Philadelphia, PA). April 25, 1809. "We have no exact return of the Election of Southampton, but we understand that at the close of the polls, Mr. Gray had in the counties of Isle of Wight, Sussex and Southampton, 215 votes a majority over Mr. Byrd. The county of Surry is yet to vote... Mr. Gray is one of Mr. Randolph's friends." Norfolk Gazette and Publick Ledger (Norfolk, VA). April 21, 1809. "Byrd, (who on the ...[___]tings, declared his admiration of, and confidence in, the late administration." The Republican (Petersburg, VA). April 8, 1809. American, and Commercial Daily Advertiser (Baltimore, MD), The Enquirer (Richmond, VA), Federal Republican and Commercial Gazette (Baltimore, MD), National Intelligencer and Washington Advertiser (Washington, DC), Norfolk Gazette and Publick Ledger (Norfolk, VA), Poulson's American Daily Advertiser (Philadelphia, PA), The True American and Commercial Advertiser (Philadelphia, PA), The Virginia Argus (Richmond, VA), and The Virginia Gazette, and General Advertiser (Richmond, VA) list 384 votes for Richard Byrd. 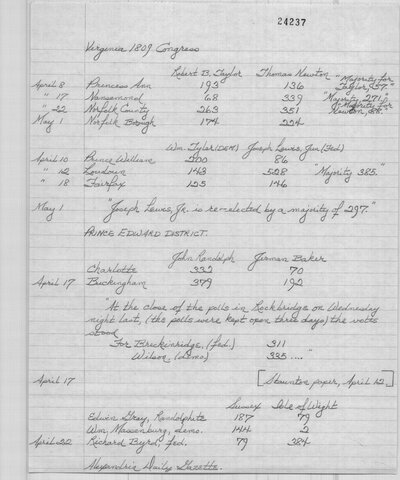 "LETTER TO THE EDITOR Surry, April 8 'Dear Sir, I rather suppose you have been misinformed, as relates to Mr. Byrd, one of the candidates for Congress for this district. Whatever his politics may heretofore have been, I am not so fully acquainted with that gentleman as to decide-- But this much I can assert in the most positive terms, that in this county and other parts of the district, he has satisfied me and a number of other freeholders, that he is a republican, and decidedly attached to the present administration. In the county of Isle of Wight, I am informed, the votes stood thus: Byrd 495, Gray 55, Massenburg 3. It is the prevailing opinion that Byrd will divide with Gray in Southampton; if so, he must be elected, as Mr. Massenburg will get very few votes in this county.'" The Republican (Petersburg, VA). April 12, 1809. "[We are proud in recognizing Mr. Byrd as a republican - because from his talents, he is fitted to be a useful and valuable member of congress, and if elected, will add to the respectability of the Virginia Delegation. If Mr. Byrd has been a federalist (which we still believe) and is now an admirer of our republican administration, he deserves to be ranked with the Grays, the Adamses, the Smiths and the other enlightened federalist who have seen the error of their ways, and embraced the principles of the good old republicans of '76.]" The Republican (Petersburg, VA). April 12, 1809. The Minerva (Raleigh, NC) lists 128 votes for Richard Byrd. "Southampton County - Majority for Mr. Gray. 402." Federal Republican and Commercial Gazette (Baltimore, MD). April 19, 1809. "It is supposed that Mr. E. Gray, is re-elected. - In Southampton he is said to have had a majority of 402. Surry not yet heard from." The Enquirer (Richmond, VA). May 2, 1809. 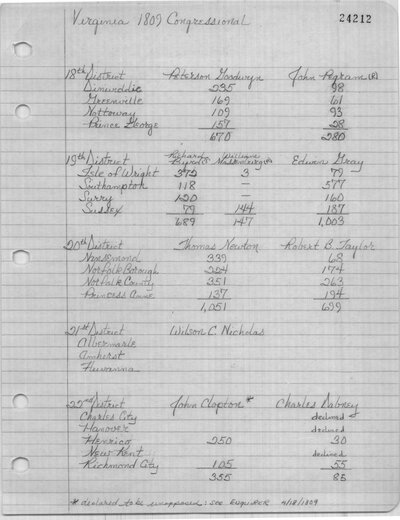 In the notes from the Sussex County Poll Book, the vote figures are reversed for Richard W. Byrd, giving him 144 votes, and William Massenburg, giving him 79 votes. 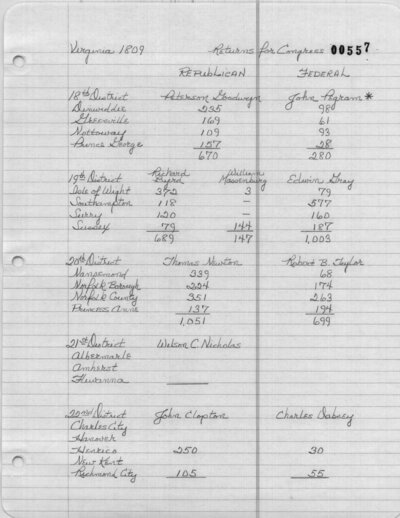 Sussex County Poll Book. Library of Virginia, Richmond. The Republican (Petersburg, VA). April 8, 1809. The Enquirer (Richmond, VA). April 11, 1809. The Virginia Gazette, and General Advertiser (Richmond, VA). April 11, 1809. The Virginia Argus (Richmond, VA). April 11, 1809. The Republican (Petersburg, VA). April 12, 1809. National Intelligencer and Washington Advertiser (Washington, DC). April 12, 1809. The True American and Commercial Advertiser (Philadelphia, PA). April 14, 1809. The Virginia Argus (Richmond, VA). April 14, 1809. The Virginia Gazette, and General Advertiser (Richmond, VA). April 14, 1809. National Intelligencer and Washington Advertiser (Washington, DC). April 14, 1809. The American, and Commercial Daily Advertiser (Baltimore, MD). April 17, 1809. The Enquirer (Richmond, VA). April 18, 1809. North American, and Commercial Daily Advertiser (Baltimore, MD). April 18, 1809. The Republican (Petersburg, VA). April 19, 1809. Federal Republican and Commercial Gazette (Baltimore, MD). April 19, 1809. Norfolk Gazette and Publick Ledger (Norfolk, VA). April 19, 1809. The True American and Commercial Advertiser (Philadelphia, PA). April 20, 1809. The Minerva (Raleigh, NC). April 20, 1809. Norfolk Gazette and Publick Ledger (Norfolk, VA). April 21, 1809. The Virginia Argus (Richmond, VA). April 21, 1809. Alexandria Daily Gazette, Commercial and Political (Alexandria, VA). April 22, 1809. Norfolk Gazette and Publick Ledger (Norfolk, VA). April 24, 1809. Poulson's American Daily Advertiser (Philadelphia, PA). April 25, 1809. The American, and Commercial Daily Advertiser (Baltimore, MD). April 26, 1809. Federal Republican and Commercial Gazette (Baltimore, MD). April 29, 1809. Norfolk Gazette and Publick Ledger (Norfolk, VA). May 1, 1809. The Enquirer (Richmond, VA). May 2, 1809. Federal Republican and Commercial Gazette (Baltimore, MD). May 3, 1809. National Intelligencer and Washington Advertiser (Washington, DC). May 3, 1809. The Minerva (Raleigh, NC). May 4, 1809.